First, keep at least one whiteboards for every seat belt. Also keep extra KleenSlate markers and a micro-fiber cloth for erasing. Write your children’s names in permanent marker on the handle of each whiteboard and label a couple “Guest.” Most mini-vans and SUVs have pockets on the back of front seats where whiteboards can be stored. 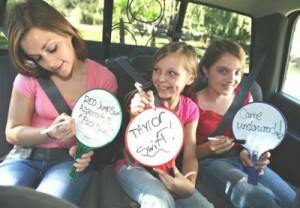 Here are 6 ways to use whiteboards in the car. Use Whiteboards to practice math facts or spelling words while Mom is running errands. Have kids draw a floor plan of their bedrooms or the family home. Draw a map from home to school or from home to the current destination. When stopping at fast food restaurants, have everyone write his/her order on the whiteboard before the stop. You don’t have to remember each order and the children can be taken to a play area to release pent up energy. Take a KleenSlate Response Whiteboard for a ride. They make car trips fun.